The Army K9 Corps came into existence on March 13, 1942. Secretary of War Robert P. Patterson signed a letter that officially allowed dogs to be inducted into the war effort. These dogs were trained for the Army's "K-9 Corps," for work both inside and outside the military. Initially intended for the Army, in the Fall of 1942, the K9 Corps program was expanded to include the Coast Guard, Marine Corps and Navy. The programs began training donated dogs and later on acquired their own. Smaller, temporary centers were established in Beltsville, MD, and Fort Belvoir, VA, to train mine detection dogs. Later on, they were trained in San Carlos. In 1950, a canine basic training course was set up in Germany at they Darmstadt School for Dogs. Dog handlers were also trained and a technical manual was developed in July 1943: TM 10-396, War Dogs. Military dog training took between 8 and 12 weeks. 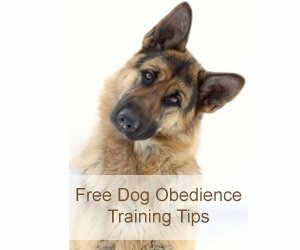 Fundamentals included basic commands such as sit, stay and come. Later on they were exposed to gas masks, gunfire, muzzles and riding in military vehicles. Once basic training was complete, K9 Corps dogs were selected for one of four specialized training tracks. Sentry dogs were trained on short leashes and taught to give warnings by growling or barking. Especially helpful in the dark, they accompanied a military or civilian guard. Sentry dogs were taught to alert their handler to the approach or presence of strangers within a protected area. Scout dogs were trained to work in silence to detect ambushes, snipers and enemy forces within a specific perimeter or as point on combat patrols. Dogs with superior intelligence and a quiet disposition were selected for patrol dog training. Able to detect threats at up to 1,000 yards, a scout dog would stiffen its body, prick its ears and hold its tail rigid. The use of these specially trained dogs greatly reduced the chance of an ambush and also served to boost morale. Loyalty was an important quality in Messenger dogs. They had to have the desire to work with two different handlers. Traveling silently, they learned to take advantage of natural cover and found their way using animal intuition and/or by following a trail of body scent. An extremely effective line of communication, Messenger Dogs carried their deliveries in a leather pouch around their collars. Also known as M-Dogs, they were taught to find booby traps, trip wires as well as metallic and non-metallic mines. These highly trained dogs served to take the advantage away from the enemy. It has been reported in the Pacific theatre that no patrol led by a war dog was ambushed or fired upon without warning. Contrast this with dogless patrols which commonly suffered casualties as a result of surprise attacks.